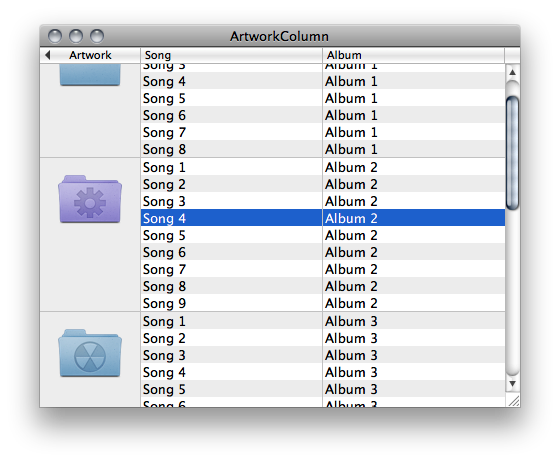 Jesper’s recent post about mimicking the iTunes Artwork Column in Cocoa piqued my interest. It seemed like it should be possible to do this just within the confines of an NSTableView. ArtworkColumn is a simple proof of concept to show how such a thing could be done. Things would get complicated if your content was more than just an image on a background, but in that case you could probably cache the content as an image and draw that cached images in slices in a similar way. Update: Paul Kim has a much improved generalized version of this approach on his blog. This entry was posted on Sunday, October 4th, 2009.